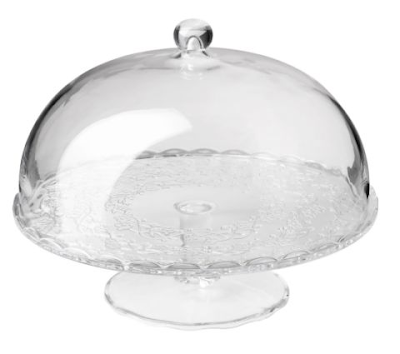 I spotted this adorable scalloped cake stand at IKEA recently (I told you I'm drawn to anything scalloped!). Budget price point ($20) and fantastic design--perfect for the Anthropologie-lover in you. Although the photograph makes it look like the lacy design on the plate itself is rather prominent, I can assure you it is less conspicuous than it appears. The first thing you'll notice about the stand is the scalloped edge which is sooooo pretty. Parked next to the stainless steel mixing bowls or online here. This is so pretty. Thanks for sharing your finds with us. Thanks for the comment-I love your blog and now I don't feel like such a stalker! You have such great taste!! !